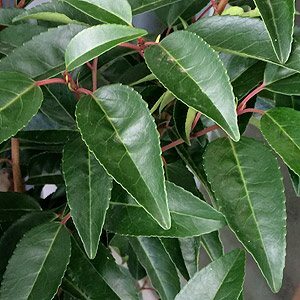 Used widely as a hedge and sometimes as a standard Prunus lusitanica or Portugal Laurel has a growth rate of 2/3m a year in good conditions. As a hedging plant or screen, P. lusitanica can easily be clipped to between 2 and 4 metres. If left to its own devices it will become an attractive small spreading tree, useful for shade as a background plant. Glossy dark green foliage is attractive through the year, scented white flowers spikes in summer are small but attractive. Small red berries follow the flowers. Ideally grown as a hedge, at the rear of the border as a backdrop to other plants or as a small tree. Generally available as potted plants from 1m to 2m in height. Excellent as a background tree in border or general garden where an evergreen screen is desired. Widely used as a hedge as it takes well to pruning. Well drained humus rich moist soil. Tolerates dry conditions once established. Tolerates 2nd level coastal conditions.